We've read some interesting books on the topic, including Surprised by the Power of the Spirit by Jack Deere which we'd highly recommend for a more "in depth" approach on the topic. Deere taught at Dallas Theological Seminary and gives more scriptural background and proof for his arguments than Always Enough does. I have on my reading list to read Miracles by C.S. Lewis and Holy Spirit by Billy Graham (someone I honestly thought I'd never touch in the reading department) and Prophecy in the New Testament Church by William Grudem. It's rather a gruelling topic but one that we feel is deserving of attention. My background is very reformed and this is a stretch for me spiritually, to say the least. However, the more I learn about the Holy Spirit's role in today's world the more eager I am to develop a personal relationship with the Helper that God sent for us and to us (John 15:26). So that's where I'm at and now you know what type of books I'm eyeing in the theological department. Now to the book at hand! The Bakers (not to be confused with Jim and Tammy, please) are missionaries/ministers in Mozambique. This book was published in 2003 and today the Bakers spend more time traveling in different countries talking about their ministry than they spend actually living in Mozambique. The most intense portions of this book focus on the years 2000-2002, following Mozambique's civil war and mass flooding and other natural disasters. Essentially, this book is a diary of what they saw and experienced while serving God and the people there during this time frame. It's more or less a documentary. They share their prayers and answers, signs and miracles, but fail to provide scriptural back-up for their message. The scriptures are dealt with in vague terms. So if you are looking for a thesis on the topic, this book isn't it. However, that being said, it's challenging in that it stretches the mind in what you think is possible today and what is closed to the early church. The Bakers feel called to minister to the "poorest of the poor" in Mozambique. They take in children from the dumps and slums and nurture them as best as they can with the resources that they have. Towards the beginning of their ministry, Heidi asked how serving the multitudes was going to be possible, due to limited resources. God's answer to her was, "There will always be enough, because I died." Their story can be likened to George Muller in that they have the same faith to sit children down for dinner and pray for the food to arrive. Muller's faith was rewarded. Apparently so was the Baker's. They tell one story of a time where there had not been food for their immediate family of four, or the hundreds of orphans that they were caring for, for days on end. Everyone was hungry. A local lady made food for just their family of four to eat. The Bakers insisted on being able to feed everyone before they would eat the food themselves. They prayed over the food and began to serve. Miraculously, there was enough food for everyone there to eat until full. Very reminiscent of the story of the loaves and fishes AND Muller's prayer for food for the orphans (although his tale is rather different and easier to buy for the average Joe). This example is certainly not the wildest that the Baker's share. There is talk of the blind being given sight (mostly explained by curses placed by witch doctors in Africa being removed by the casting out of demons)and the dead being raised to life. It's a radical and intense book. To say the least. There are a great many more examples I could share. Their base argument to Christians is that we must come to the realization that the power of God is just as available to us today as it was to the apostles. Like I said, this is not a thesis. This is merely a documentary of the things that God has chosen to do through their ministry and through their obedience. Jonathan and I both feel that this power is available to Christians today. However, we really don't seek it and frequently doubt that it exists. How much more would we see and experience of God and His ways if we truly believed that all things were possible? It's rather mind boggling and, quite frankly, rather frightening. Jonathan and I both like things we can get our minds around. What can be easily and solidly explained? What can you share that won't sound foolish? What can you do that won't seem strange and bizarre? Why do we care so much? God calls us to be utterly abandoned to Him and yet our argument back is, "Well, if I abandon myself and surrender myself to Your will, You might do something I don't feel comfortable with." I for sure feel that way. I like comfort, safety, and the familiar. I don't like surprises. Learning how to be surprised by God and still be in a decent mood afterwards is rather difficult. He's a disconcerting God at times. He shakes us up and spills us out and gives us bruises. We lick our wounds, ask why, and try to revert back to our old thoughts and ways, convinced we know better than He does. But how could we? Therefore I can't lay this book aside and say, "Well, that's nice for the Bakers. Thank heavens I'll never have to witness any of that." While its true I could potentially avoid such things, do I want to? Their book didn't convince me of anything. Rather it posed the question of: "What if...?" Can it happen here in America? Can it happen in my hometown here? Can it happen in our home? Will we close the door on it? It's much easier to accept the present than the scary unknown. But what is the potential in being able to see Him manifest Himself more fully in our day-to-day lives? Why would we pass it up? In order to avoid the risk of looking foolish and sounding foolish when we explain what God has done? I can testify to only this in my own life -- for every problem that has cropped up in my pregnancy I have called on my church for prayer. The moment I have either 1. asked for prayer and/or 2. had someone lay hands on me and pray for me, I have experienced instant healing. I'm fully convinced that God can heal instantly and miraculously. Of course, it's much easier to believe when it comes to bad cramping or acid reflux problems. I would likely be more doubtful if I were to begin going blind or something more frightening. My faith has been built up in the little things but on the big thing I'm still skeptical. Most people are. The Bakers testament to the things they have seen and/or heard of and/or experienced for themselves is very believable. For Mozambique. But why not here - in America? 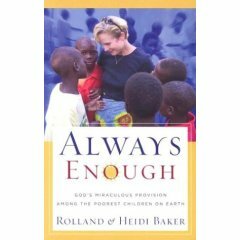 You can hear Heidi Baker speak at www.fireonthealtar.com. There are some powerful compilations there that changed my life. This sounds like a lovely book. I'm always convicted when I read about people giving of themselves to help those in such great need. It reminds me of how selfish I am when I get irritated that Safeway is out of the particular brand of milk that I'm looking for. To truly be in need and to utterly trust God to provide is something I've never had to experience. It scares me to think I might have to one day, but then again, it might prove to be liberating.